If you have plans to make home improvements this year, then you need to read this before you make any decisions. Chances are that you have more than likely considered which improvements will increase the value of your home. Two common options are remodeling your kitchen or bathroom. They are both excellent options, but can be among the more expensive remodeling options. So what about adding brick pavers? It’s true what they say… “your home truly is your castle”. You should enjoy it as such. Because it can reelect your personality, taste, and values. Its all you! There’s one area, though, where there’s a risk in being too “individualistic”. That’s the landscaping. Your landscaping is the first thing visitors, and potential buyers, see. It can reflect well on your home. Or it can do the exact opposite. This is probably why there are such exacting standards set by homeowner’s associations. There’s no need to go over the top or start creating shapes in your shrubs. It’s as simple as making smart decisions about your material choices. Great landscaping can increase your home’s value by almost 30%. If the value is already high it can be as much as 10%. That being said, you shouldn’t make your landscaping decisions based solely on resale. It’s an investment that can also be for your enjoyment. When you enlist the services of a professional masonry contractor, you can increase your home’s curb appeal and value with the addition of brick pavers. 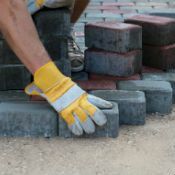 There are a variety of ways you can use brick pavers. Gardens are pretty, and pleasant, and environmentally friendly… but an excellent way to freshen up your front yard is by adding pavers. It doesn’t mean you have to get rid of every bit of greenery, but you can use pavers to create a lasting first impression. Another way to incorporate brick pavers into your landscape design is by defining your driveway. You can create a new driveway, which will add value to the property by providing space for cars to park, thus creating more space and security. Ideally, your driveway will have space for two vehicles and your masonry contractor is experienced in creating a stunning brick paver design. Walkways are the perfect option to bring brick pavers into play. A stunning walkway provides guests with a welcoming path to your home. Forget your guests trudging through wet grass, or mud, to get to your front door. Allow your masonry contractor the chance to create a stunning walkway to welcome your guests. Pavers are the more expensive option when it comes to the choices in walkway materials, however, they provide you with excellent quality and are durable. Before you make any serious improvements to your home, it’s important to have a look around your neighborhood. Any upgrades or renovations that you make should be in line with the other homes in your neighborhood. If you go too big you will have a difficult time recouping your money, as buyers looking in a middle-class neighborhood won’t be able to afford your home. The buyers that can afford it, won’t be looking to move into your area. There are plenty of options when it comes to home upgrades that will improve your home’s value and curb appeal. Curb appeal is an excellent way to lift your home’s value, and it’s incredibly important when it comes time to list your home. When a buyer pulls up to your home you want to create a solid first impression, and the home’s exterior is the first impression. Failure to create an initial impact could turn a potential buyer off from wanting to even view your home. An excellent way to make that first impression is by incorporating brick pavers, whether you opt to create a stunning walkway, a two-car driveway, or you incorporate it into your landscape. A brick paver walkway provides a welcome entry point to your home, or to a well landscaped deck gazebo. A brick paved driveway provides a striking introduction to your home. Pavers intertwined through your greenery, plant life, and garden offers a stunning landscape for your home to sit upon. You can choose one, two, or all three. No matter how you want your masonry contractor to integrate brick pavers, we can get the job done.